Tom Norton celebrates with Ales Padelek. Player-coach Tom Norton senses another Phantoms hot streak could be ahead. The city team reeled off 11 successive victories in all competitions earlier in the campaign. It was a run which established them as pacesetters in NIHL Division One South and ensured they breezed into the latter stages of the NIHL Autumn Cup. It was brought to a surprise end in early November and Phantoms have generally found the going to be considerably tougher in the weeks since, but Norton now feels they are ready to kick on again after an emphatic NIHL National Cup triumph last weekend when thumping Sheffield 6-1. He said: “We’ve had a patch where we haven’t converted enough of our shots into goals, but I think we showed last Saturday that we’re coming out the other side of that now. “I felt a big win was coming if we continued to play with the same passion and desire we have been doing and we got it in an important cup game. “Now we need to kick on again in the league. We’re proud to have led the way throughout the season so far and we want to stay at the top of the table. “I said in the summer that a good start was essential in a much smaller season and that is exactly what we produced. Phantoms complete the group stage of the NIHL Autumn Cup competition on Saturday night with a trip to Basingstoke (6.30pm). Both teams are already assured of semi-final spots but will no doubt be keen to claim victory and a psychological advantage ahead of a couple of big festive clashes in NIHL Division One South. Phantoms currently sit three points clear of the Bison in the league standings, but the Hampshire side boast two games in hand. Phantoms then make a rare Sunday appearance on home ice this season when entertaining London Raiders in a league contest (5.30pm). 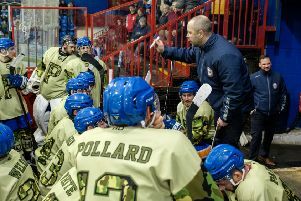 And they are will hit their home rink in determined mood to avenge a 6-3 loss at the hands of the same opponents last month which brought that 11-game winning run to an end. Norton added: “We know we’re already through in the Autumn Cup, but it is important to win any game regardless of the competition or what is at stake. “We don’t want to develop bad habits and that is what happens if ever taking a game lightly. “It’s a game against one of our rivals for honours in at least two competitions and we want to put in a performance there. “It will be nice to have a Sunday home game and hopefully plenty of fans turn out in force. We know what to expect from London. They will come out quickly and try to hit us hard again, and we need to be ready for that.